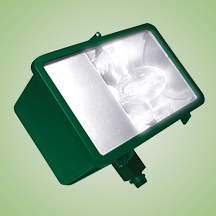 The SRF Flood Light is a compact HID light ideal for site, display, landscape, and general security lighting. Designed specifically for lighting small trees with medium canopies. A number of shielding options are available for customized effects. The housing and door frame are constructed of die cast aluminum. The flat tempered glass lens is sealed in place and a door gasket is provided for weather tight protection. ETL listed for wet locations. Available in 50W thru 150W pulse-start metal halide, high pressure sodium and mercury vapor. Comes standard with a 4KV pulse rated medium base socket. Each 60HZ CWA Multi-Tap1 or 480V ballast is pre-wired and installed for convenience.